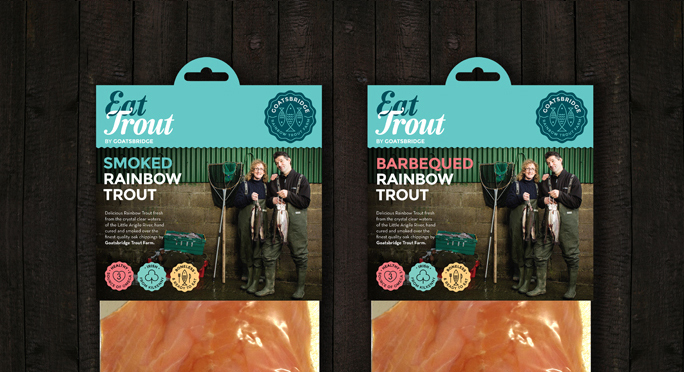 Trout is called an oily fish due to the beneficial omega 3 fats, EPA and DHA that it contains. Precursors to these fats are found in some nuts, seeds and avocadoes, but the omega 3 fats in these foods rely on the body converting the fats to EPA and DHA. When we eat oily fish, such as trout, the fish have done the conversion for us so the beneficial oils are more readily available to the body. WHAT IS IT RICH IN? 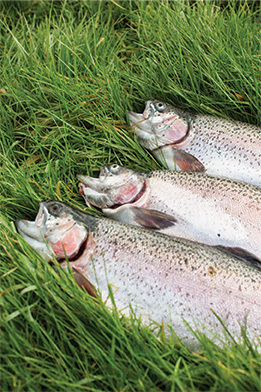 Just 100 grammes of trout will provide over 1000 milligrammes of the EPA and DHA. These fats are vital for brain function and development, hormone health, fertility, skin, hair and nail health and energy. The omega 3 fats also have anti-inflammatory effects so are useful in inflammatory disorders such as arthritis. Trout is a good source of minerals including selenium and iron. Selenium is needed for thyroid function, fertility, removal of heavy metals and immune function. Iron is needed for energy production and hair and nail health to name a few of its functions. 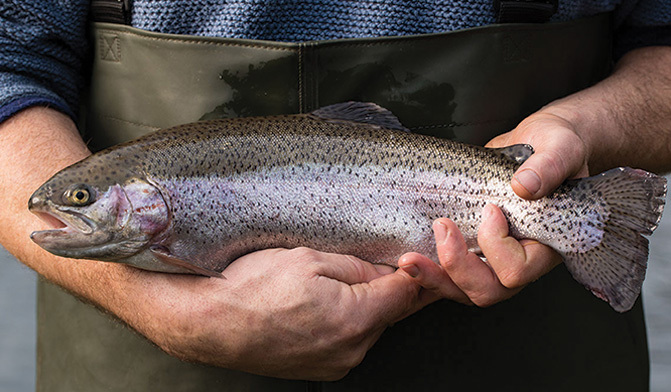 Trout is also a good source of vitamin B12, a vitamin that is poorly absorbed from supplements. B12 is needed for energy, muscle development, bone health, brain function, digestion and the prevention of cardiovascular disease. Trout also contains niacin (vitamin B3) which is particularly important for nervous system function and brain health. Our process consists of four stages, preparing, curing, smoking, slicing and packing. We begin with the freshest Goatsbridge Trout fillets and pin bone them, then wash them and prepare them to be cured. The skin is left on to hold the fillet together until the very final stages of slicing. The most commonly used methods are a dry cure or brining (liquid) – at Goatsbridge we apply our cure by hand in a dry rub. Curing is used to draw out the moisture and is primarily salt – although we utilize sugar as well – and other herbs and spices depending upon the recipe. Drawing out the moisture firms the texture and imparts a deeper flavour. Once the cure has been applied, the fillets are placed on racks to cure for a minimum of 4 hours in refrigeration. Prior to going into the smoker, the fillets are rinsed of the salt/sugar cure and air dried on the racks. 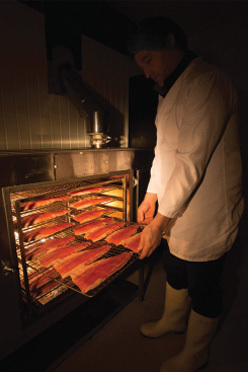 Smoked or Cold smoking means curing fish by smoking it at an air temperature not higher than 33°C to avoid cooking the fish or coagulating the protein. The cold smoking does not cook the fish, resulting in a delicate texture. Barbeque or Hot smoking means curing fish by smoking at a temperature of 70 – 80°C at some stage in the process. Hot smoking ‘cooks’ the fish giving it a firmer texture. This texture makes it a great addition to salads or pasta. Once the fillets have gone through the smoking processes, they are cooled on racks for over 24 hours. When ready for slicing, the skin is removed, and each fillet is hand fed through our custom slicer. From there, the slices are portioned, placed on our custom packaging, and then individually vacuum packed, labeled, and ready for you to buy! Or if you would like the opportunity to learn to smoke trout yourself you can do a day lone smoking workshop with us where you will learn all the tricks of the trade!